Get mobility swiftly and comfortably with Swift scooter rental in Washington, DC. Scooter rental, power chairs, and wheelchairs with our show room in Houston TX. We serve the Washington DC and Houston area with delivery and pickup mobility scooter right to your door. Operators are available 7 days a week and are happy to provide no-obligation estimates for your convention, cruise and vacation rentals. Swift scooter mobility are here to help you visit your destination swiftly. 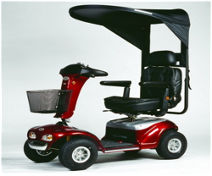 Those who have difficulty getting mobility, we provide them with freedom mobility in any of our products that include canopied scooters, power chairs, and standard wheelchairs. Swift Wheels is your source for scooter rental, repair, and sale. With 10 years of experience and dedication to serving our customers, Swift Wheels offers swift, same day service and we're happy to be helping those unable to help themselves. It makes our customers very happy as well. Looking for a co. that has an excellent 10 yr. reputation. Cancel 48hrs prior to your rental due date and receive a full refund. No Hassle, simply call us and we will process your refund immediately.